Under New Jersey law, a device is "red tagged" when a code enforcement official has a reasonable belief that a device covered by the code is not compliant with the applicable code. In this case the ticket reads "Placed out of service". 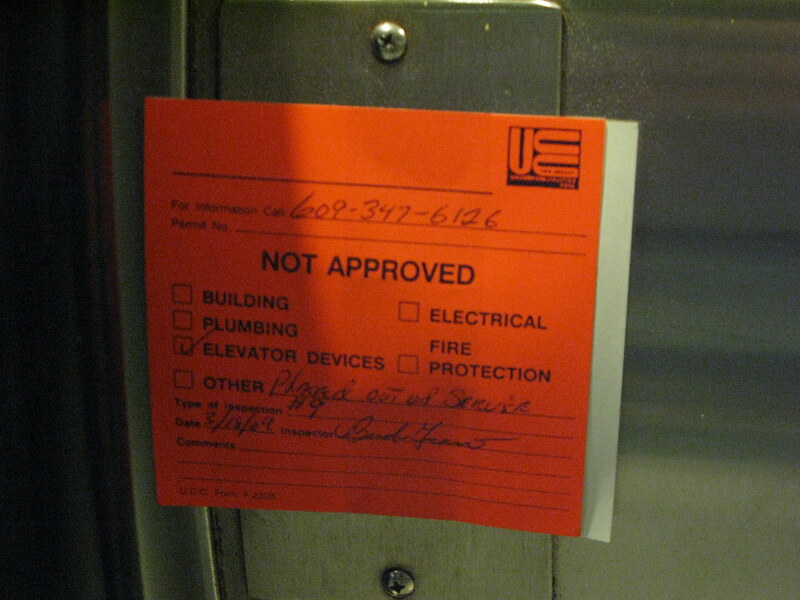 What is extremely unusual about this red tag is that it indicates the "type of inspection" as "#9". In fact, the Uniform Construction Code only provides for 7 different types of tests. This red tag is likely part of the reason that the area near the bus terminal was abandoned. Had the escalator near the bus terminal been allowed to remain in service, there would've been no reason to close the bus terminal. However, because the escalator was required to remain inoperable by law until the building owner resolved the violations that led to the red tag, the building owner made a calculated decision to simply abandon the bus terminal and the red-tagged device. In other words, it was cheaper to just close the old bus terminal, place some plastic over the glass doors and windows, and pretend that area of the hotel no longer existed.